Before we examine the markings of a real estate top: San Francisco Bay Area home sellers are cutting their asking prices at alarming rates. With that being said, the unraveling of the housing bubble is spreading across the country. San Francisco Bay Area homes are slashing their asking prices at the highest rate in years, said the San Francisco Chronicle. On a seasonal basis, September, October, and November have generally been big months for price reductions, as sellers try to close deals before the holidays and early Feburary. However, this year is different, the number and percentage of homes with a price reduction jumped to the highest level since 2012 in the Bay Area and 2011 statewide. The jump in price cuts, which has spread across the entire county, is more evidence after years of rapid increases, prices are plateauing and risks of a strong seller's market is developing into 2019. "Price cuts are a leading indicator because they are reflected immediately," said Patrick Carlisle, chief market strategist at Compass real estate brokerage. 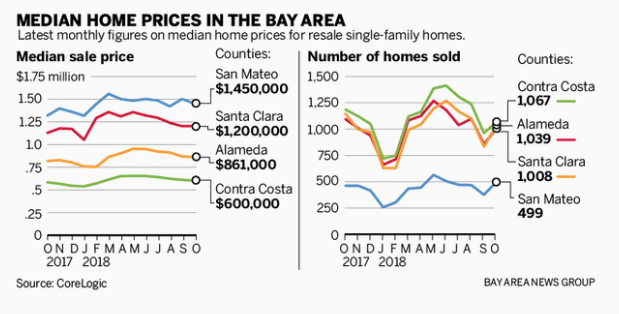 Although Bay Area home prices are still inching higher on a yearly basis, home sales, median prices and days on the market are considered lagging indicators. This means the turning point in the market could take time but serves as a warning the next cycle could involve a downward momentum in prices. 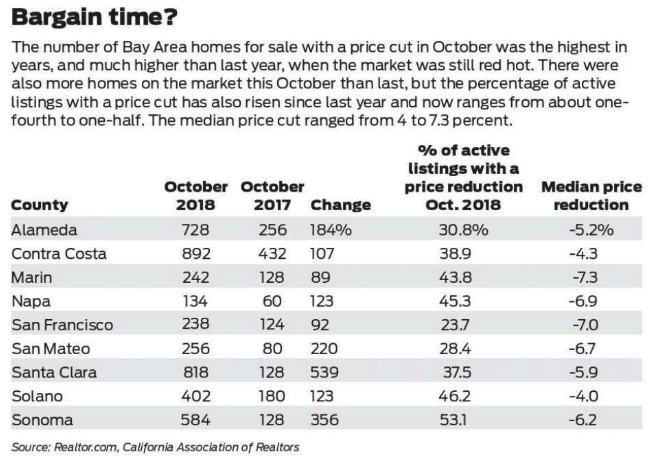 According to data from Realtor.com, the number of Bay Area homes with a price cut in October nearly doubled, to 238 from 124 last October - a sign that sellers are starting to get desperate. The San Francisco Chronicle notes that in Santa Clara County, the number of price cuts exploded to 818 last month, more than six times 2017's figure. Home sales in the region declined 4% from the same time last year, with more buyers sitting on the sidelines in Santa Clara, Alameda, and Contra Costa counties, according to CoreLogic. The median sale price in October for existing homes grew 6.9% over the previous year to $860,750. Industry observers say price growth is solid, but it is the slowest rate of growth in more than a year. CoreLogic analyst Andrew LePage said price growth has moderated as buyers are watching prices fall from record high levels. “There’s been a psychological shift in the market,” he said. The Bay Area housing market is showing signs of a top. Next comes downward momentum in prices, which could occur as early as Spring 2019, that is when the real panic could set in.